I ordered a new writing book from Amazon last week. I have no idea why. No one recommended it. I had no real intentions of ordering any book at all, but I saw it on one of those links from something else I was looking at… to tell the truth, I can’t remember exactly how I came upon it, only that I did and for some reason it looked interesting. 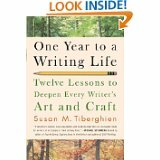 It’s called One Year to a Writing Life: Twelve Lessons to Deepen Every Writer’s Art and Craft and it’s by Susan M. Tiberghien, an American-born writer, married to a Frenchman, with French-speaking children and living in Geneva Switzerland. Not the sort of person I’d generally choose for writing advice. So says Michael Steinberg, founding editor of Fourth Genre: Explorations in Nonfiction and author of Still Pitching. I have no idea who he is, and have never heard of Fourth Genre nor Still Pitching. I can’t for the life of me figure out why I got this book. That quote reached off the page, grabbed me by my shirt and pulled me close. It’s exactly what I had been thinking about, remembering what it was like to actually write a first draft, develop a new world, a new set of characters… It’s been awhile. And this just drove right to the heart of it all. There’s more to this than just that, though — the part about the work being done “beyond the reach of one’s intelligence” echoes what I wrote in That Nameless Faculty Again about an aspect of ourselves we don’t understand and can’t control. The part of our souls that brings forth a story. Or a song or a painting… Mostly without our conscious control or even awareness. Anyway, I’ve barely started it. Read the Introduction and part of Chapter One. Already I’ve got underlinings and comments in the margin and things I want to think about, ideas being added to things I have already been thinking about. If all those thoughts coalesce into something coherent, I might even blog about them. And I did all this and still managed to work a bit on Sky — moved on from page 10 to page 14 in Chapter One (covering material that reached to p 17 in the original so I’ve cut another page…). Hooray! This entry was posted in Creativity, writing life and tagged born writer, creativity, nameless faculty, Rainer Maria Rilke, writing life on September 19, 2011 by Karen Hancock. Sounds like a God incident for sure, Karen. I had a similar one at the beginning of my writing career. Wonderful how God gives us just what we need when we need it. Some folks have been saying that about my devotional ebook for writers, Abundant Rain. It’s such a thrill to know your words are helping others do what God intended them to do. Abundant Rain is at http://www.smashwords.com/books/view/58017 in case you’d like to have a look.